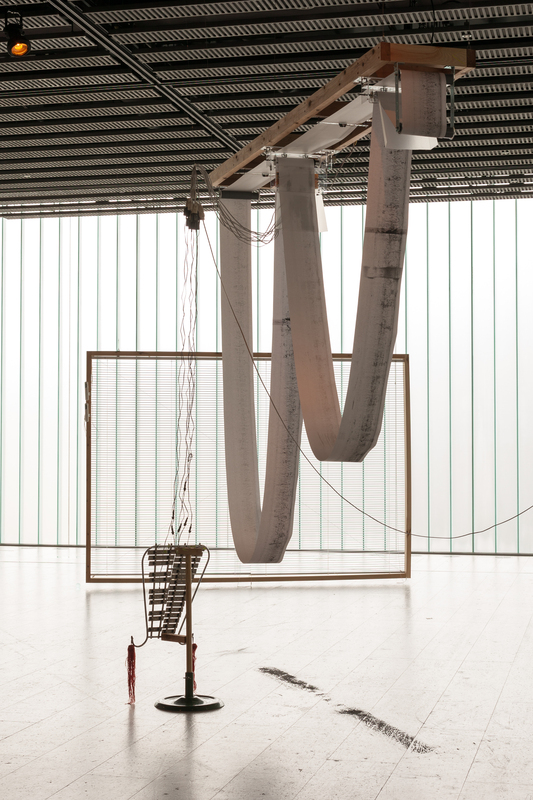 I/O is an installation that creates an organic ecosystem where the form and movement of the work responds to exhibition conditions in a flexible manner. Gently cascading rolls of paper pick up charcoal powder, dust, and other debris. 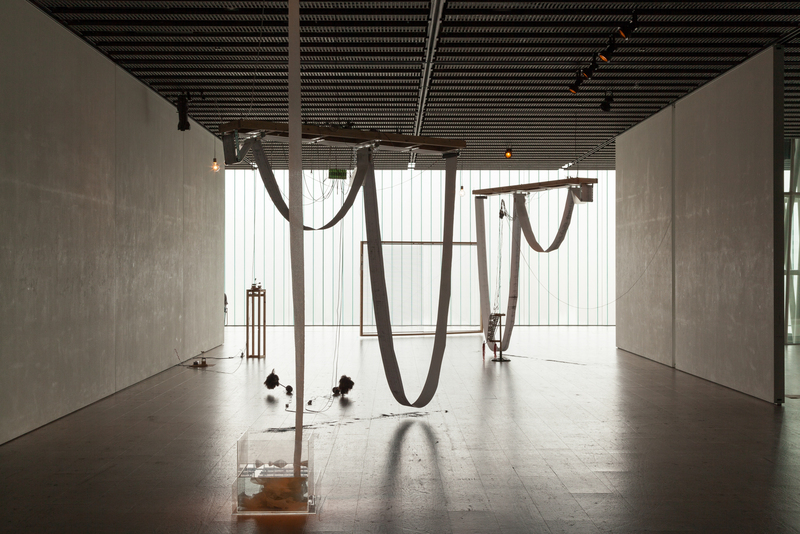 Their traces are scanned and converted into random input-output electric signals that cause a constellation of objects, such as feather dusters and old musical instruments, to move. 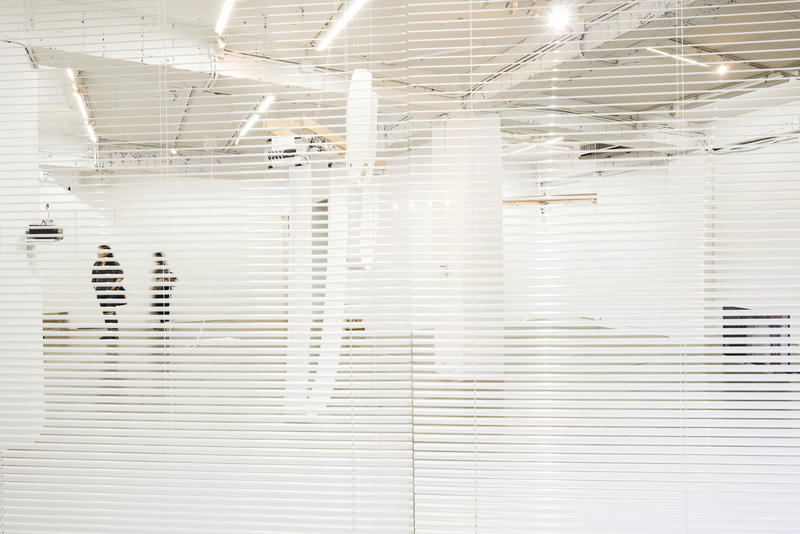 The site-specific characteristics — including movements of air, humidity, and the undulating surface of the floor — that remain in the white cube, which tends to be regarded as a flat space, are picked up by the rolls of paper, gradually permeating it with the unique features of the exhibition space. The result is an organic environment where the same phenomenon never occurs twice. In this case, the gallery might be likened to a biotope-like ecosystem that interweaves the natural and artificial. The rolls of paper, too, seem to behave like living beings themselves: an ongoing manifestation of the ancient Japanese divine spirit of yorishiro — a religious awareness or worldview that is responsible for creating the characters seen in Japanese anime and other cultural forms. 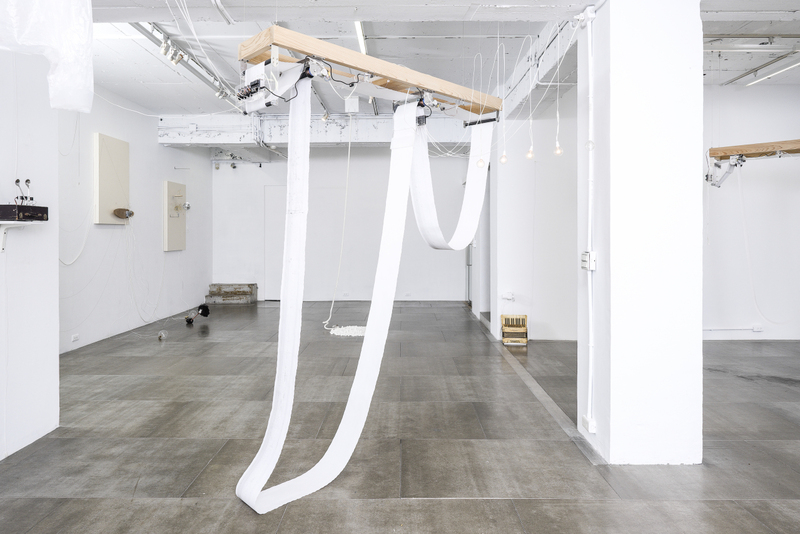 Faced with Mohri’s work, viewers cannot help inserting themselves into the scene, imagining that the pleats and creases in the overlapping rolls of paper are actually sentient beings…but this link soon unravels, and the rolls of paper dissolve into the environment once more. See also I/O: Chamber of a Musical Composer. Materials: Roll paper, Bamboo charcoal, Bell-lyras, Dusters, Blind, LED Lights, Toy, Spoon, Toilet tissue, Aquarium, etc.